Some time in the 1880s, the locomotive manufacturer Nielson received an order, given the number E636, for 6 “Mogul” 2-6-0 engines and tenders. 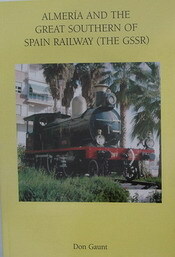 The order came from the newly formed Great Southern of Spain Railway (GSSR). The 4th of these, works number 3846, was to be given the name Águilas, after the town where the GSSR had its HQ. Águilas and the 5 others were delivered to the town’s port on 30th September 1889 from the ship Mimosa. Over the next 20 years, 19 more of these engines were built by Nielson, Kitson, Sharp-Stewart and North British. In the early 1940s, Engine number 4 was renumbered RENFE 130-2124 when the railway system was nationalised. Águilas, along with its 23 companions, went on to give between sixty and eighty years of faithful service. In the 1960s, however, steam gave way to diesel and all the steam engines were scrapped. All but one, that is. Águilas was saved and placed on a plinth in Isaac Perel Square in front of Águilas harbour. Miguel Lozano Costa, a diesel engine driver, tells the story of how he took the engine to its final resting place. "When steam finished, it was decided to make a monument to the railway. I was the only person at the time who could drive the diesel shunter so I was given the job of taking it to the Plaza Isaac Peral. For the occasion I was given a new suit and cap. I had to make two journeys because when I got there, the plinth was only long enough for just the engine. So I had to take it back to the workshops, get them to remove the tender, then take it back to the port again. The route from the station passed in front of the old Capri cinema to the Paseo Parril. Here, the line went along the front to the port. At the time, there were many branch lines about the port. However, they were in poor condition and I first had to check with the diesel that the one which led to the plinth was capable of bearing the weight of the engine. Before I could do even this, a gang of 15 - 20 workers from Ways and Works had to go along the track, replacing screws and repairing the line. A small ramp had been constructed and I pushed the engine into place. I recall that a broken cylinder had been repaired in the workshops but the engine was never used again." The engine is still there (picture,left) a little battered but still reasonably complete. However, I noticed some years ago that the manufacturer’s plate did not seem to tie in with its history as it said “North British Locomotives 1905” not Nielson 1889. The works number on the plate (16726) showed that it belonged to engine number 20, “Jaravia”, (picture, right). I was curious but could not find anything useful about this. There the matter lay until at the end of 2009, I received an email from a correspondent, Bob Barby from the Railway Correspondence and Travel Society, posing the same question. I felt that I had to try a bit harder this time so I contacted Ken Livermore of the North British Locomotive Preservation Group. I gave him the story and as much information as I could. His reply follows. The engine is easy to find, just go to the port where there is lots of parking. The station and museum are just a few hundred yards away along the front. 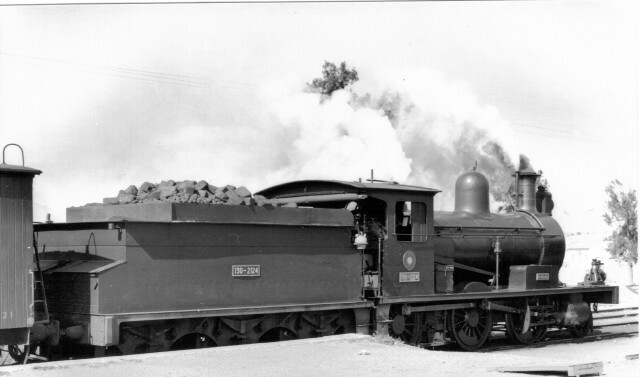 I've checked through our records of preserved NBL / Constituent locos and the engine Águilas is shown as a Neilson 2-6-0, Works Number 3846, built in 1889 for the LBA Railway, Spain. RENFE No. 130-2124. The NBL Works Records show that locos Nos 16726 to 16731 were built in 1905 for the Great Southern Railway of Spain to NBL Order No. L105. They were also 2-6-0's. Without photos of both the engines, it is difficult to say what happened but maybe the works plates somehow got transposed during subsequent overhauls at the workshops in Spain. This was not uncommon, even on BR locos in the latter days of steam. This was useful information and confirmed my other sources. I then looked at a 1960 picture of Águilas and could see a discrepancy. I sent Ken the following email. Thank you for the information. I am sure you are right. I attach a blow-up of the plate on Águilas taken in 1960 by Lawrence Marshall. It is too blurred to read but the shape of the letters and no obvious works number make it seem likely that this is not the same plate as today’s. 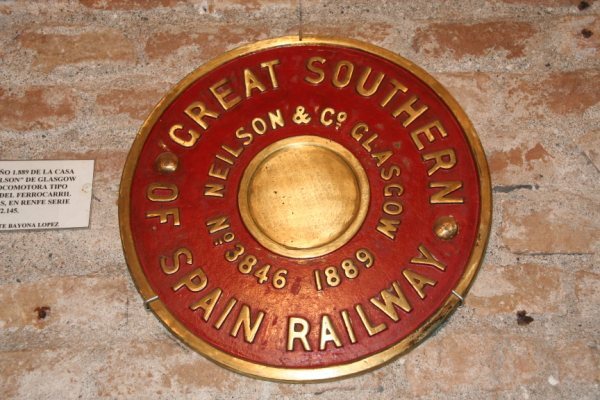 On the original it is just possible to make out “The Great Southern of Spain Railway” around the edge. This seemed to be about it, but suddenly Bob contacted me. Just been browsing through your web site and clicked on to the Águilas Museum site. This shows a picture of the plate of the original " Águilas " and it is clearly a Neilson plate. It is said to be in the museum at Aguilas. It states this is the plate from the loco on display in the square. If so why put a NBL plate on it? So where did we stand? With the testimony of Miguel Lozano Costa and the comments of the museum, it seems pretty certain that it is the right engine. Also the RENFE number is correct and I didn’t see the workshop changing this. On the left is an interesting picture from a book by Joaquín Gris Martinez "Railway workers of the Lorca Baza Águilas line". 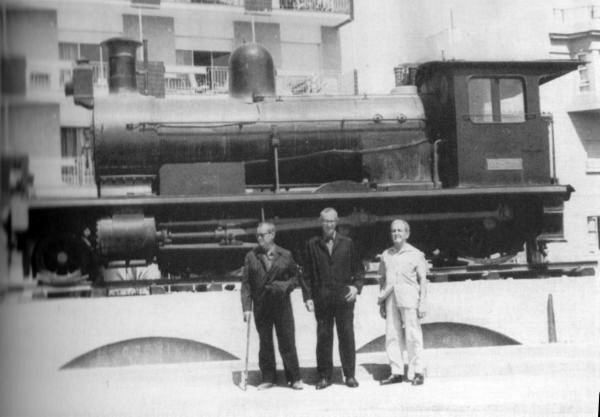 It shows a worker, Fulgencio Aguilar Cazorlo standing in front of "the steam engine Águilas". However the engine has no plates except the RENFE number. The picture is none too clear, but by careful use of a photo program, I am fairly certain that the number is 2124, Águilas. Where was the picture taken? It would appear to be on its plinth, and there is no tender. However the plinth does not look like that today, so it might have been at the station, waiting for delivery to the plinth. Why were the wrong plates put on? Could it be that when they got the engine ready for going on the plinth, they couldn’t find the right plates? Or perhaps they could only find one. I guess that with everything being scrapped, it was a shambles in the workshops, so they just grabbed two that they could find. Another distinct possibility is that souvenir hunters had taken some of the plates away, see Gerrit’s email below. How did the one plate (I assumed it was only one) get to the museum? 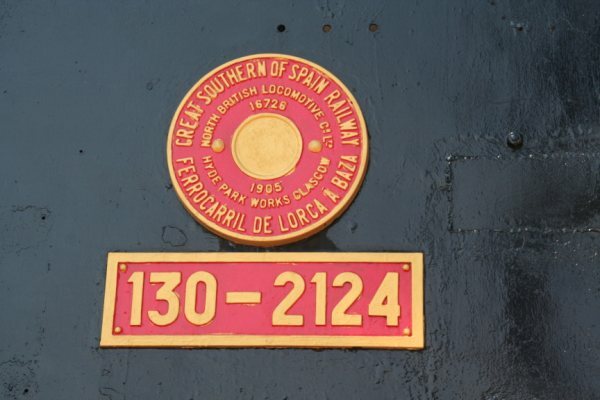 I asked Gerrit Visser, a friend who lives in Águilas to check the plates on the engine and in the museum..
We finally have been able to complete the check on the missing plate of the “Águilas” locomotive and have found the following. a. Yes, the plates on either side of the engine are fully identical. I have taken pictures of both and send these to you by separate e-mail today. By coincidence we learned from a gentleman from Águilas who we met at the opening night of the “Gustavo Gillman Photos Exhibition” in Almeria, that these plates originate from the locomotive "Jaravia". b. Yes, the one proper plate is on display inside the museum. You will receive my recent picture of it also by separate e-mail, as well as of the very interesting text plate mounted next to it. The text says that the name plate has been donated to the museum by Don Vicente Bayona Lopez. We happen to know that Mr. Bayona was a well known dentist in Aguilas, that this original plate has for many years been on the wall of his office and that his father worked at the GSSR in Aguilas at the time of scrapping the old locomotives! c.	No, nobody knows where the second original plate is, neither the gentleman we met in Almeria nor the attendants of the museum. Reflecting on the above b., we hope that some day the second plate will also come out of someone’s private collection and turn up in the museum. The plate says:- "Plate No 3846 of 1889 from the construction firm Nielson of Glasgow (Scotland), of the locomotive type MOGUL, series 1-25 from the Lorca-Baza-Águilas railway. RENFE series 130-2121 to 130-2145. Donated by Don Vicente Bayona Lopez". There are still some questions unanswered but we now know a lot more than we did. My sincere thanks to all those who have helped in constructing this story. Below is a brief history of Nielson from Wikipedia. The company was started in 1836 at McAlpine Street by Walter Neilson and James Mitchell to manufacture marine and stationary engines. In 1837 the firm moved to Hyde Park Street and was known as Kerr, Mitchell and Neilson and, in 1840, Kerr, Neilson and Company, becoming Neilson and Mitchell in 1845. In 1884, Neilson left to form a new company at Clyde Locomotive Works but, though Reid became the sole owner, it was not until 1898 that the company changed its name to Neilson, Reid and Company. However, by this time, intense competition from America meant that small companies were unable to survive. There was a need for amalgamation, and in 1903 Neilson Reid combined with Dübs and Company and Sharp Stewart and Company to form the North British Locomotive Company, the largest locomotive company in the world, outside of the United States.